Shay Savage: Unexpected Circumstances Excerpt! Need a little taste of what is to come? 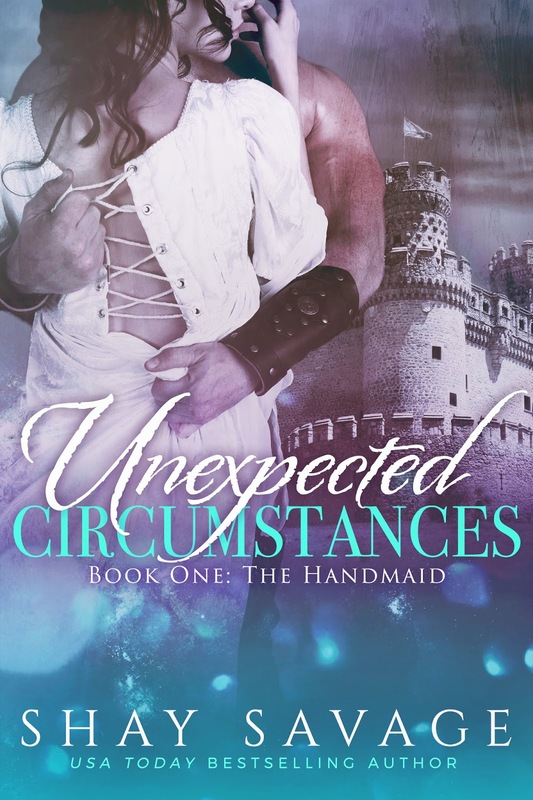 Here's a little piece from Unexpected Circumstances, Book 1: The Handmaid, which will be live on May 31st! Available for preorder now! My husband, whom I knew so little about, was about to claim my body as the final act solidifying our union. I had only the very basic understanding of what was to come. I was absolutely terrified but trying desperately not to show it. Remembered words of pain and blood scurried through my head as we approached a pair of large, wooden double doors. Sir Branford reached out and pulled on the handle of the door leading to the last chamber. His eyes traveled up and down my body before he placed his hand on the small of my back, and we walked through. I heard the clang of the latch as the door shut behind us, sealing us in for the night. Without warning, my back hit the inside of the door. Sir Branford’s hands were on my head, quickly removing my wedding veil and tossing it to one side. He combed his fingers through my hair, letting it flow loosely around my shoulders. Again, his eyes roved from my face to my feet, then back. I looked into his hooded eyes and startled at the way he stared at me before his mouth crashed onto mine. This was not like the first kiss, when we were pronounced man and wife. It was not like the gentle touches of his mouth to my hand, lips, or neck while we danced. This kiss was hard and fast and filled with urgent need. He grasped the sides of my face with his hands and tilted my head sideways. I felt his tongue as he traced the slight parting of my lips before he pushed it inside my mouth. At first I was shocked. I felt my body go rigid from the sudden intrusion. The feeling of his tongue in my mouth was not unpleasant but strange and unexpected. I could taste the wine he had consumed after the feast, combined with a simply indescribable flavor that must have been solely his own. I could hear and feel his rapid breaths against my mouth. My heartbeat quickened, and my breathing might have followed if I could have caught my breath at all. I placed my hands on his wide shoulders, not knowing where else I should put them, and held on while he ran his tongue along mine, touching and tasting me. He dropped one of his hands to my shoulder and then down my arm until it reached my hip. Slowly, he moved his hand around and grasped my backside, lifting me slightly off the floor as he pulled me against his body. I could feel the tip of something long and hard press against my navel. I gasped into his mouth, and he released my lips only to travel to my neck, covering my throat with hot, wet kisses. My skin was left warm and tingling. He lowered me back to my feet and moved his hands up my sides, his thumbs brushing the sides of my breasts, causing me to gasp out loud. He continued his movements up and around the back of my shoulders, then quickly up and down my back as his lips covered every area of skin they could reach. He continued his effort with his eyes when his hands left me. I watched him reach down and pull off his belt and sash, dropping them in haste to the ground. With his trousers loosened, he pulled the ends of his shirt out before reaching for my hand and pulling me closer to him. His hands moved up and down my back again, searching.